Stan Rodda | my story, ministry and life in general! my story, ministry and life in general! So, I decided to move my blog. I wanted to do something a bit more general. So head over to my new site, Stan Rodda, for all the great new stuff. Well, new stuff anyway. See you over there. Subscribe and all that good junk. One of my favorite sites for financial resources is Christian Personal Finance. They have an amazing library of free resources for all things financial from a Christian perspective. Here are two links to a couple of my favorite blogs on their site. Head over to their page. Subscribe to their email updates. And while you’re there, sign up to win a free iPad 2! =) Now that’s hard to beat! There you have it. Let me know. Let me stop here. For those of you who don’t know me personally, I never say weird things like that. Typically, that kind of “Christianese” simply annoys me. But for some reason, this time, it was different. Then God said, “I am giving you a sign of my covenant with you and with all living creatures, for all generations to come. I have placed my rainbow in the clouds. It is the sign of my covenant with you and with all the earth. When I send clouds over the earth, the rainbow will appear in the clouds, and I will remember my covenant with you and with all living creatures. Never again will the floodwaters destroy all life. Somewhere along the way, rainbows became associated with different movements or stereotypes. Rainbows were somehow linked with unicorns and Rainbow Brite. Yet, I stared into the colors of this rainbow. Each color shining clear and bright. A near, complete arch, stood proudly displayed in the sky. A bold reminder that rainbows are not girlie. They shouldn’t be linked with unicorns and fairies. And it is far bigger than a community of people. The rainbow stands alone as God’s promise to mankind. A promise to never again flood and destroy all of humanity. In all honesty, I don’t fully understand God’s mindset when it comes to the flood. But there is one thing I know…the rainbow is His. It is a symbol of mercy and grace. It is a symbol of His covenant. Hi, Stan. My promise is still good. They never fail. I love you. What do rainbows mean to you? What Should I Name My Church Plant! When it comes to church planting, there is a lot to ponder. Until I feel the spark to talk about other areas of church planting, I want to go ahead and offer a few tips to church planters and future church planters out there. This post will deal specifically with your church’s name. When it comes right down to it, your church name is going to be the center piece of your marketing, it will reflect who you are, what your values are, everything. You are setting out to change the world for Jesus and chances are the first impression people have of you will be your church name. That’s why the church name is almost as important as financial funding (insert hilarious laughter here). That being said, I have some very important church names that you should consider for your church plant. That’s right. You want people to know that there’s only one vineyard in town that God has chosen, and it’s yours. That other church down the street? Forget them. They don’t even have the right name on the door. Surely God isn’t working in their lives. You want everyone to know that if they’re going to be picked in God’s glorious elect, they better be in your vineyard. After all, it is the Lord’s. What we’re hoping for here is for people to be confused and think you meant, “immaculate reception.” If that’s the case, they might think you’re talking football. And if you know football, maybe you’re only half-weird. Get them in the door with this brilliant “bait and switch” name. Whispering Pines. Whispering Grove. Whispering Creeper. Who’s whispering over my shoulder? This is just getting weird. Still, God spoke to Elijah in a whisper on a mountain side. You want people to know that at your church, they will be hearing God in whispers over their shoulder. Plus, this way you get to get them started in some Old Testament knowledge right away. They’ll be learning Bible and won’t even know it. If your church name is longer than your mission statement, it’s a good one. Because the one thing you don’t want to have happen is for the lost to actually remember your church name. After all, new people means being uncomfortable. So let’s just confuse them with a ridiculously long name on the sign. Look, I get it. You’ve lived in Boring, (State Name) since you were conceived. You are proud of the 1/2AAA Girls Checkers State Championship your school won in 1903. So go ahead and spit in the face of first impressions. Who cares if people drive by and think your church is boring. It’s worth it because of 1903. So, there you have it. It’s not an exhaustive list, but I do hope I have helped to ease the burden that is the hard work of church planting. Feel free to use these free of charge for your church plant, or you can create your own variation as well. Now, get out there, start a church and confuse the heck out of the people in your town. If you have a desire to church plant and you believe God is leading you in that direction, let me know. I would love to pray for you (seriously, no satire here). Also, you may want to click the image above to help you get started on your church planting journey. If you were to come into my home and listen in on some of our family conversations in the house, you would hear me getting onto my kids periodically for different things. Sometimes it has to do with the way they treat each other. Sometimes it has to do what they are saying about someone else. But none of those even come close to the one thing I’m always all over them about. It’s a small thing really, but in the long run it’s a big thing. My wife might even tell you that I get onto them so quickly about manners that I sometimes fail to give them the chance to use them. Maybe so. But manners are a big deal to me. This was only reinforced during my time in North Carolina. It seemed like every where we went, people were only too willing to extend a hand of common courtesy. Letting you pull into a space in front of them. Starting a conversation with you as if you had been friends since birth. The kindness to give us a free sweet tea, not because we ordered one, but because you were just extending a hand of good, old fashioned, southern hospitality. I want to help my kids grow to be respectful and kind to people around them. I don’t want them thinking they are above treating people respectfully for the things they do for them. Some days my kids are really on the ball with manners. Other days I go to bed with a sore throat. Still, being at the beach simply reinforced for me my stand on manners. What do you think about manners? Once again this summer I am spending a week, sitting on the sand of Carolina Beach, North Carolina. I’m soaking up a lot of sun and family time. It has been a great week. “Of course,” was my reply. “I’d love to hear them,” I would say. And before you know it, tomorrow becomes ten years and you aren’t sure where the time went. Then you live in regret because you missed some of your kid’s best moments. Do you have a son you should be playing catch with? Do you have a daughter you should be having a tea party or playing Barbies with? Do you have a child you should be listening to because they have questions about something they read? Try changing your answer and watch their eyes light up. Social Media Does The Body Good! The way we interact today isn’t like it was in the old days. Back in the “good ol’ days” people would talk to each other using their mouths and eyes, not their computers, websites and fancy smartphones. The way we connect, communicate and interact seems to be changing constantly at a blinding speed. The minute I catch up with one thing, I’ve already got to learn a new one. Fortunately for me, I actually enjoy the social media fad. I’m on most major social media platforms. I enjoy connecting with new people and catching up with people from my past. Social media has completely changed the landscape of communication. I want to speak specifically to those who are involved in ministry for a minute. You may or may not like social media. It may be something you naturally connect with or you might look at it and be completely baffled as to why anyone would get involved with such craziness. I’m here to tell you something; your ministry needs social media. Trust me, it does the “Body” good. 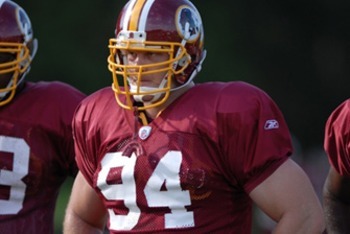 This is Adam Carriker. He is a former Nebraska Cornhusker, stand out defensive lineman and Blackshirt. He is a current Washington Redskin, right in my backyard. I follow Adam on Twitter and am a “friend” on Facebook, mostly for selfish reasons (to keep up with Husker players). However, this connection would prove to be extremely fruitful. At our Campus in Haymarket, Virginia, we have a ministry we call, “Grab Your Groceries.” We connect with social workers and guidance counselors in our local schools in Prince William County. Through them, we are able to help provide grocery relief for some of the poorest in our area. We meet very few of the families we serve, but based on our connections, we know the help is going to those who need it most. The schools and families we serve are beginning to trust us more than other social organizations and it’s awesome to watch as they call us up and ask us to help us with different events at their schools. I think we’ve stumbled on to a way to bring Jesus to schools without bashing them over the head with a Bible study or prayer group (but that’s a post for another time). To help GYG grow, we are planning a huge benefit concert. This is where social media comes back into the picture. I sent Adam a direct message on Twitter, briefly told him about myself and introduced him to GYG. I also was so bold as to ask him to help us out. He responded with a message of his own and the conversation took off from there. I found him on Facebook (to make messaging simpler) and gave him more details. He was happy to help. I asked him to donate cleats, signed by him, that we could raffle off to raise money to buy groceries for the families we serve. He loved the idea and agreed. No long lines waiting for an autograph at a mall. But I did make a connection with a professional athlete in the most powerful city in the world. And he is helping us serve the community in his own way. And I couldn’t have done it without social media. Facebook, Twitter and more, have the power to connect you to people around the world like never before. And in this case, it has served to further ministry efforts to provide grocery relief for those who need it most in our area. Social media is capable of some very powerful things. So, what do you think social media could help you and your ministry accomplish? In what ways do you utilize social media to your ministries advantage? Do you see ways that social media can be used to help make disciples? Thanks, Adam Carriker, for the awesome donation! You’re the man! Go Huskers! And, Go Skins! We will be raffling his cleats at the benefit concert on Saturday, September 10th. Follow Adam on Twitter here. Check out his bio as well. Maybe he knows a little something about making a difference in people’s lives. …you don’t have what you want because you don’t ask God for it. Could life really be that simple? Could it be that so much of our struggle in life is because we simply try to do it on our own and we don’t ask God to intervene? I was thinking about this in the context of ministry and church life. Instead of complaining that I don’t have enough volunteers, I’m starting to ask people to volunteer. It’s an amazing concept, I know. As a staff at New Life, we are asking God to change people’s lives and that He would lead people to baptism. I know, crazy huh? Ask God to intervene in “our” work. The best part, seeing so many changes in people’s lives the minute we start asking for it. We have seen God do some very cool things. I’ll save some of those stories for another post. I don’t know if she will take him up on the offer, but I think sometimes we don’t have, because we simply don’t ask. Are you as a minister taking time to ask God to intervene in people’s lives? Are you as a minister taking time to ask people to get more involved? Are you simply asking the question? I am striving harder to ask both of these questions. I am asking God to change people’s hearts because I know I can’t. I am also starting to simply ask people to get more involved. It’s amazing how much you can accomplish with a simple ask. So who do you need to ask? Do you need to ask God to do the hard work of changing people’s lives? Do you need to ask a neighbor to come to church? Do you need to ask someone in your ministry to step it up? Last fall I played in a men’s flag football league in Fairfax, Virginia. It was a blast. One of my teammates was named, Bryan. He and I played defense on the same side of the field (this meant we got to know each other really well). He had a great phrase he would use during crucial moments of a game. He would look at me right in the eyes and say, “Time to do work, Rodda! Do work!” Granted, the grammar isn’t great, but the phrase gets the job did done. That phrase and his intensity always challenged me to run a little faster, to jump higher and work harder than the guy lined up across from me. Now jumping to present day life. Our Campus had an awesome Sunday. Our theme was, “Get Right With God.” We had really cool stories lined up for people to tell about how God has impacted their lives. We talked a lot about the Jordan River and water in Scripture. It seems to me that water, especially the Jordan, carries some powerful significance to God. Every time the Jordan is mentioned, it seems there is some transition in life, something leading to victory and hope. We challenged people to come to the banks of the Jordan. To get their feet wet. To make a commitment. To dive all in for God. To give Him full control of their lives. To immerse themselves in the waters of baptism. Then, we handed them a card. We challenged them to fill out the card and to tell us about a commitment they might need to make. We also asked them to tell us how we could pray for them. What things in life were holding them back from giving God their all and how we could we be praying for them. Then it happened. I sat down that afternoon to read the cards. I began to pray for individuals by name who were going through some very serious things in life. And to think they trusted us enough to tell us what was going on behind closed doors. I believe it was a huge moment in the life of our Campus. I want to serve as a better example for my family – wife and kids. To live a life with God and Jesus in control. …the strength to save my family. My marriage. It is dying. And this was just the beginning. As I prayed for these people and families, I was overwhelmed with emotion for them. I was blown away by their honesty and their stories. And that’s when it hit me. Do work! Satan is doing work. He’s working. He’s getting after it. He’s destroying lives. He’s lying to people about what brings fulfillment and purpose. Oh yes, Satan does work!